I’m sitting in my car, trying to make myself to walk into work for my overnight shift, thinking of my not-so-little little guy sleeping at home with a cold. As I got ready to leave the house earlier he had shuffled out of his room, swaddled in a giant throw blanket (stolen from my couch), asking if I was going to be at work all night. I said yes and he immediately stifled a sob and scuttled back into his room before I called him back for a long intentional cuddle, my heart squeezing and breaking. I work only a night or two a week, mostly when my kids are already in bed. They sometimes forget that I was at work at all the next day. They’re independent; they do lots without me and will leave me in a heartbeat to zip to a friend or family’s house with barely a kiss goodbye. Sometimes I almost think of them as grown up already. But when they’re feeling crummy or have a lot on their mind? They still need us. It was a sweet reminder to me, in the rush of every day, that they still need special time together to keep our relationship close. The same way all friendships and relationships need one on one time! Some of my favorite memories growing up that made me feel connected with my parents were of mundane things like standing in the kitchen chatting with my Dad as he made Saturday morning breakfast and of being with my Mom in the morning as she brushed her long long hair in front of the bathroom mirror for what felt like forever. I’m longing for those same moments with my kids! Like all the parenting mags suggest, I’ve tried to make “date days” with my kids one on one and while those are wonderful, sometimes just squeezing in an hour into the week to do that is hard. I was challenged by a more experienced mom that I respect to do something a bit different. She said to try to involve the kids in my daily work. Working together with them rather than trying to set them up with things to keep them occupied while I work really has opened up lots of good moments with my kids that doesn’t cost any money or even really change the flow of my day. Letting a kid sit on the counter with me while I cook, or letting them help me cook. Reading together aloud from chapter books, even now while my two older kids are proficient readers on their own. Taking one kid, solo, with me while I food shop so we can have time to talk and walk. Having one kid help me with a chore like putting away the laundry while the others play. My husband cuddling up with one of them in the evenings while they watch him do his work on his computer and learn as they talk. Most importantly, though it’s SO much easier to get things done myself – I love efficiency and working fast! 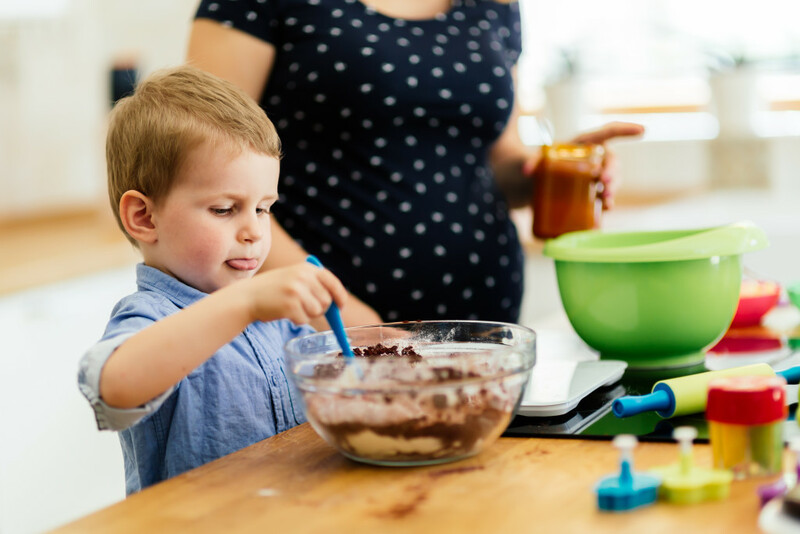 – I know that it’s valuable to teach my kids to pitch in with the daily work of life and also to make that a everyday opportunity to connect, even though it often takes a little longer and may be a little sloppier! My kids have become unexpectedly great at clearing the table with me after dinner without being asked, helping me fold laundry together on my bed, and tidying up when they see me doing it, and it gives us so many chances to talk and laugh and just be together while things are busy. It’s great, especially as everyone gets older and busier with their own hobbies and interests. What are some practical ways you connect with your kids every day that give you opportunity to talk and be together? Anything else good that I’m missing?